From an SEC evidence exhibit. BULLETIN: The SEC has gone to federal court in Houston, alleging that Firas Hamdan was conducting an affinity-fraud scheme targeted at the Lebanese and Druze communities. 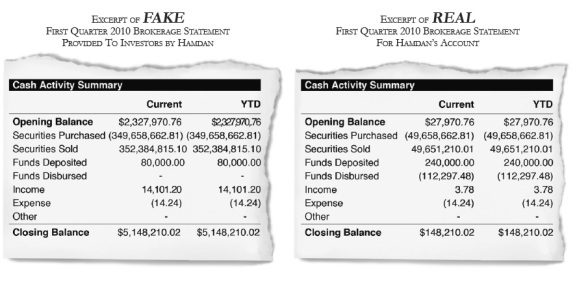 The agency is seeking an asset freeze against Hamdan and his unregistered company, FAH Capital Partners Inc. The scheme is alleged to have gathered about $6 million over five years. Hamdan is 49. The SEC says he has an address in Houston and previously used an address in Sugar Land. Falsified records helped drive the scam, the SEC said. “Although the precise terms of the notes appear to vary among investors, the notes generally provide for returns of approximately 30% per year,” the SEC charged. Read SEC Investor Alert on affinity fraud. At its core, affinity fraud exploits the trust and friendship that exist in groups of people who have something in common. Fraudsters use a number of methods to get access to the group. A common way is by enlisting respected leaders from within the group to spread the word about the scheme . . .
Read the SEC complaint against Hamdan.